Impress blinds presents immense assortment of strong and solid window blinds. See our scope of modest window blinds. We have various window blinds segments to look over, with the window Blinds Sale offering a huge determination of shading, of surface window blinds. The Blackout window blinds area offer a wide decision of Blackout materials. Window blinds are ideal for bigger windows and patio doors, giving you style. If you are based in Huddersfield (West Yorkshire) then you can easily get our services, our team will help you choose the right blind that suit your decor. We offer not only for our Huddersfield (West Yorkshire) customers, but all over the UK client’s. Impress Blinds Offers are 3 roller blinds for £119 with selection of multiple colours. If you require 3 vertical blinds for £79 along with free measuring and fitting then you can easily contact us. We also offer 5 vertical blinds for just £139. We are also giving an option to our valued clients in Huddersfield and across UK for fitting, on your selected day. We offer vast quality of texture and design and our blinds are made to measured,manufactured in the UK. We have made our reputation in Huddersfield on our quality work and service in the last several years. 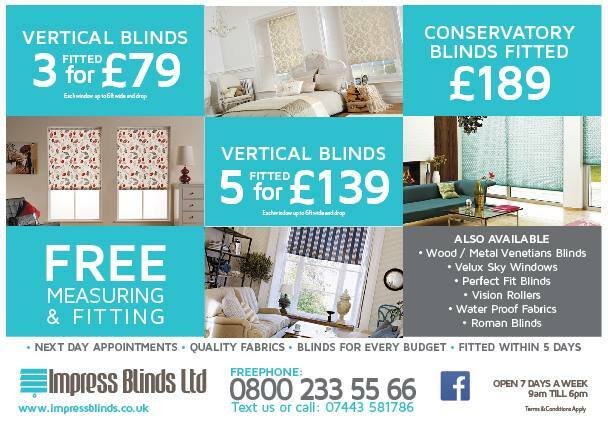 If you require blinds in huddersfield the Call now and get booked in for a free consultation.